What is Sage Business Cloud Accounting? Sage Business Cloud Accounting (previously known as Sage One) is an easy-to-use cloud-hosted accounting application. What sets Sage Business Cloud Accounting apart from its sister app Sage 50cloud is that the former is an add-on service that allows for the integration of the latter to the cloud. This integration results in cloud storage and accessibility for all your accounting information. It is a merger of two excellent tools that makes Sage Business Cloud Accounting better than ever. With it, you get access to a dashboard equipped with extensive data visualizations for your transactions, giving you a more comprehensive overview of your business anytime, anywhere. Functionalities include supplier purchases and customer sales history, along with bank statement imports, which empower you to manage your banking and cash flow. Sage Business Cloud Accounting is smartphone-friendly also. You can log on and view customer information and record notes any time using your Android device or iPhone. Search for customers and contact them straight from your device. You can also process quotes and send them to your customers on-the-fly. If you need directions, you can use the map links to find your way to your customer’s offices. Sage Business Cloud Accounting provides small businesses basic income- and expense-tracking as well as other useful features. The app is easy to navigate with an appealing dashboard. The summary tabs on the dashboard provide you a graphical overview of your company’s sales, expenses, cash flow, and forecast cash flow. Cloud-based accounting and invoice management tool Sage Business Cloud Accounting is designed specifically for small businesses. The solution offers accounting, expense management, project accounting, and compliance management capabilities, all in a single platform. With the tool, you can manage just about any payment documentation and processes, including invoices, estimates, price quotations and statements. 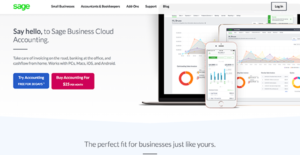 What sets Sage Business Cloud Accounting apart from its sister app Sage 50cloud is that the latter is a cloud-based add-on service with which the former can integrate. This integration provides Sage Business Cloud Accounting with cloud storage and access for all accounting information. Sage Business Cloud Accounting makes all your accounting data readily accessible from a singular dashboard, keeping you constantly updated on matters such as cash flow and receivables. Doubling as a tax management tool, the product can compute appropriate taxes in accordance with available transaction data. Cash flow forecasting is likewise possible, enabling users to come up with cash requirement estimates using transaction history as basis. The platform’s interface is clearly labeled and it is simple to find features. The dashboard’s summary tabs show starter tasks and graphs with customizable date ranges. You can create estimates and quotes, and convert them to invoices easily and quickly. In addition, you can customize invoices with your logo and select between two templates each for product and service-based invoices. You can also toggle the delivery address and tax display, and add notes and terms. Users can manually enter billable time and expenses to invoices, but a minor drawback is that the application lacks a built-in feature that streamlines these tasks. On top of that, you can track bills, manage vendors, and enter data about inventory items into this system such as categories, descriptions, and pricing. However, the software does not track inventory or print checks. Other main benefits are you can run more than a dozen financial reports that empower you to analyze your business, including a general ledger and an aging report. You can link your bank account and credit cards to reconcile your accounts. Mobile apps are available for both Android and iOS devices, and you can use them to create invoices, record expenses, and view graphs of your company’s performance. Plus, this system integrates with many third-party programs, and you can give your customers the option of paying your invoices online by adding Sage’s payment processing to your account. The company’s website hosts a knowledge base, a blog, and how-to videos, and you can buy training courses through Sage University. Customer support agents can be reached through live chat, email or ticket. Other excellent areas of this accounting software are analysis by project and department, automatic sales tax entry, and multiple price levels. Online: run your business from anywhere, anytime. There are popular and widely used applications in each software group. But are they automatically the best fit for your company’s unique needs? A popular software application may have thousands of users, but does it present what you need? For this reason, do not blindly invest in popular systems. Read at least a few Sage Business Cloud Accounting reviews and think about the factors that you wish to have in the software such as the fees, main tools, available integrations etc. Then, choose a few solutions that fit your needs. Check out the free trials of these apps, read online comments, get information from the maker, and do your research thoroughly. This in-depth groundwork is sure to help you select the most excellent software application for your organization’s special wants. How Much Does Sage Business Cloud Accounting Cost? We realize that when you make a decision to buy Accounting Software it’s important not only to see how experts evaluate it in their reviews, but also to find out if the real people and companies that buy it are actually satisfied with the product. That’s why we’ve created our behavior-based Customer Satisfaction Algorithm™ that gathers customer reviews, comments and Sage Business Cloud Accounting reviews across a wide range of social media sites. The data is then presented in an easy to digest form showing how many people had positive and negative experience with Sage Business Cloud Accounting. With that information at hand you should be equipped to make an informed buying decision that you won’t regret. What are Sage Business Cloud Accounting pricing details? What integrations are available for Sage Business Cloud Accounting? If you need more information about Sage Business Cloud Accounting or you simply have a question let us know what you need and we’ll forward your request directly to the vendor.